We're kicking off a new series of interviews with scientists, sci-fi authors, creators, and cultural icons. Each interview will touch on the theme of our upcoming Escape Velocity convention: technology as a mirror for humanity. Read on for our first interview of the series with screenwriter and television producer Morgan Gendel. Margot Rose, Sir Patrick Stewart, and Morgan Gendel talk about “The Inner Light” at Creation Entertainment Star Trek Convention, Las Vegas 2017. Image courtesy of Heather Ferris. In the movie The Martian, Matt Damon’s character Mark Watney has to figure out how to survive, alone, on Mars after his team of astronauts and explorers left him for dead on the red planet. Even though the movie is a few years old now, you won’t find spoilers here on what happens. A lot of what takes place in the movie is rooted in actual science. It’s a concept that science fiction movies have been taking far more seriously in recent years, hiring actual scientific consultants to determine the realism of the futuristic story that is trying to be told. Sure, as an audience, we are expected to suspend a certain level of disbelief; that’s a given in the genre. At the same time, we do want some semblance of realism that gives us a feeling - even if it’s a fleeting one - that what we’re watching could one day be possible. Heck, Star Trek had flip phones. HAL, in 2001: A Space Odyssey was a precursor to Alexa, only with some rogue artificial intelligence. 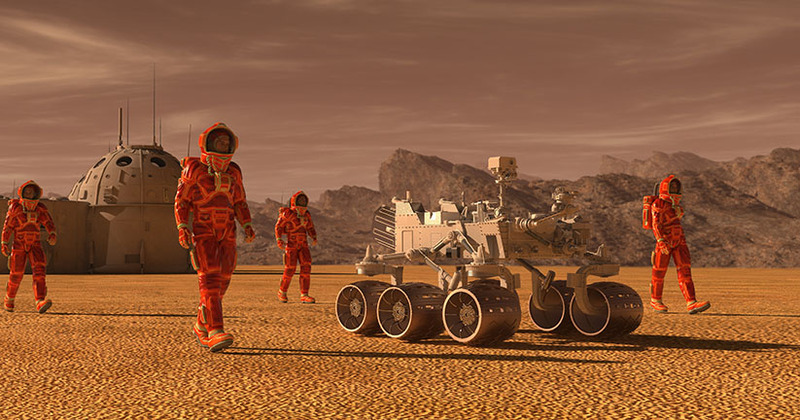 So, the notion of living on Mars – simply surviving on Mars – while it’s definitely still science fiction, may not be as far off as one might think. Business magnate Elon Musk, the CEO of SpaceX, has been saying humans will reach Mars by 2033. Morgan Gendel tends to agree, and just might have an idea that will help. Gendel, a producer and writer for several television shows (most recently co-executive producer of The 100) who is most noted for writing “The Inner Light” episode of Star Trek: The Next Generation, has been hard at work developing a soil-packed domicile that can be used on Mars – or even benefit mankind here on earth. Gendel, who also serves on the advisory board for the Museum of Science Fiction and spoke at the 2017 Escape Velocity event, has designed something known as Habolith, as in habitat built out of regolith, the term for non-Earthly soil. Is a colony on Mars just a matter of time? The concept behind the Habolith is born out of the trials and tribulations experienced by Watney in The Martian. The granular compression Gendel talks about is of the ubiquitous Martian regolith. Currently, there are students taking a course Gendel co-created at Cornell University exploring that very mechanism. An example of granular compression Gendel mentioned is a bag of vacuum-sealed coffee, which, when you buy it, is hard as a rock. But as soon as you open it and the vacuum breaks, uncompressing the coffee grounds, it’s no longer hard – that’s granular compression. Back to his inspiration from The Martian, Gendel added, “Why not take this same technology and use it to create the cab of the rover? Start with a little plastic thing, inflate it and then granularly compress it to be a cab or an antennae tower. So, any of those things that you would want to bring from earth, now you just bring one machine that does the plastic mold of these things, and then you make everything else by basically turning soil into concrete without any water or adhesive. In the meantime, while the notion of colonizing another planet – or even our own moon – remains a dream, Gendel feels his design can serve a practical purpose here on earth. Habolith can be used in disaster zones and as shelters for refugees or the homeless. Will the Moon be the first stop on the way to Mars? Unlike Musk, Gendel has his sights set first on the moon as a way station which we can and should inhabit before turning to Mars. “If you go to the moon you can do mining and construction in super low gravity and then it would make it much easier to go to Mars,” Gendel said. “And don’t forget, the moon is always there in front of us. We always have contact with it. It’s not a great amount of time to get there. Gendel has always been the kind of person to shoot for the stars. He took his love of science fiction as a kid and turned it into a successful career in Hollywood. And although he’s worked on television series’ not rooted in the sci-fi genre, he was always drawn back to science fiction – and that’s because of the study of technology that comes with it. It fits in perfectly with the them of the 2019 Escape Velocity event theme: Technology as a Mirror for Humanity. With science fiction becoming far more mainstream today than it was even as recently as a decade ago, the technology we see on screen or read about in science fiction books can be applied to everyday life to make a better society for humans walking the planet earth. Technology is ever-evolving, and doing so rapidly, which changes the image that humanity can see of itself in that mirror. Gendel points out that a movie from his youth best explains that. In the meantime, Gendel is still planning on making great science fiction. Taking a page from his Hugo-winning episode of Star Trek: The Next Generation, for his episode “The Inner Light,” Gendel has developed a new series that, while he can’t give away too many details publicly, is nearing the final stages of being picked up. But Gendel is even more excited about something he first talked about last year at Escape Velocity 2018. “I have finished my first science fiction novel,” he said. “I’m doing cover art right now. And as soon as I get it out there I’m going to rely on all the Escape Velocity and Museum of Science Fiction people to give it a read. The novel, entitled Planet Six is due out in time for the holidays. Meanwhile, Gendel is looking forward to returning to Escape Velocity for next year’s convention, to be held May 24-26 at the Marriott Gaylord in Washington D.C.’s National Harbor. Speaking as an advisory board member, Gendel noted that “Escape Velocity started out as a way to promote the Museum of Science Fiction but is fabulous on its own because it combines science and sci-fi and I don’t think anybody is doing that, at least not on a regular basis.” Gendel said. “That’s important. There are so many science fiction fans now. As recently as 10 years ago the TV business said science fiction is a niche audience, and that’s all changed now. It’s kind of exploded into the mainstream. So now I think it’s important to steer science fiction toward more real science.